Venison is delicious! Folks that don’t enjoy the harvest, are missing the best part. Usually they tend to overcook the meat or are not very creative when coming up with new recipes. Below I will explain some recipes I have gathered over the years and show you how to cook venison properly. Years ago, I was part of a hunting camp where everyone shared in the total camp harvest each season. All members were presented a bag of meat, even if they never pulled the trigger. If everyone is hunting, someone is a camp cook, or contributing to the work, then this is a fair and sporting gesture. If the hunters are sitting in the truck smoking cigarettes or making little to no effort to fill their tag, then this is not very fair. One hunter made a point to insist that he get his fair share. Make sure you give me my free meat! This hunter spent most of his time in camp or at the bar. After several years of this, we were asked to move some furniture at his home. When we finished, one of his friends opened the lids on 2 huge basement freezers. They were full of deer meat. It was then that he confessed that he hated deer meat. Although he had never eaten any, he still wanted his fair share. He would not give it away, feed it to the dogs, or try and cook it. All of years of hard work dragging, butchering, and sharing sat in his freezer! His trophy were his full freezers! What a waste! If you are not going to eat the harvest, find another sport. There are also hunters that give their meat away to feed the homeless or soup kitchens. This is certainly a nice gesture, but once you learn how to cook venison properly, this will change. Here are some great, healthy, recipes to try and empty your freezers! Holidays are a great time to share your hard-earned harvest. You need 1 loin, toothpicks, (soaked in water to prevent burning), 1 lb. of bacon, cream cheese, sliced onion, sliced jalapenos, and a bottle of Italian dressing. Cut the loin into 1-inch cubes. Slice the bacon in half down the middle. Take a slice of bacon and add a piece of onion, jalapeno, cream cheese and a cube of meat. Roll it up and use a toothpick to hold it together. Place these into a bowl and dump the Italian dressing over top. Let this marinate for 2 hours. Grill over medium heat until the bacon is done. Serve and enjoy! Deer meat is not just for dinner. Try using your grind or sausage along with some sweet potatoes for a different and delicious starter. 1 pound of sausage or grind will do. 2 medium skinned, sweet potatoes cut into ¼ inch cubes are next. A chopped onion and bell pepper will add flavor and spice. Cook 4-6 eggs with this recipe. Sauté the onion and pepper in some butter. Once the onion is translucent, add the tates. Sweet potatoes add a different flavor that goes well with wild game. Cook until the potatoes are soft. I cook the meat separately and add it to the cooked tates. Throw in some salt and pepper, or your favorite spices. You can cook your eggs separately, but I just add them to the mix. Once cooked, serve them in a wrap. Some eaters add some hot sauce to their tasty burrito. No dirty dishes or silverware to clean. There will also be no leftovers. Stuffed cabbages are a favorite of many hunters. The spices from Asian cooking kicks the Halupke up a notch. Preheat your oven to 350 degrees. Grease a casserole dish and add 2 tbsp. of oil. Now add 1 grated onion and 1 cup of diced mushrooms. Sauté for 3-5 minutes. Add grated Ginger, or about a teaspoon of powdered. Stir and add 1 lb. of ground venison. I prefer a wooden spatula to break up the chunks and to scrape the pan. Add 1 cup of cooked rice and a tsp. of 5 spice powder to the mix. Now throw in a tbsp. of Soy Sauce, sesame oil, and ½ tsp. of fish sauce. When the meat is no longer pink, turn off the heat. To blanch a head of cabbage leaves, bring a pot of water to a boil. Have another bowl filled with cold water and ice. Take the separated cabbage leaves and add to the hot water first. Once they begin to cook, remove them and put into the cold-water bath. Take a blanched leaf from the bath and add ¼ cup of the cooked meat on top of the leaf, near the stem end. Roll, tucking the sides as you go. The leaf size will determine the amount of meat you can add. Less is more when trying to make a nice roll. Place the rolled cabbage bundles into a greased casserole dish. For a nice presentation twist, blanch the tops of spring onions. Use them as cord to tie the wrap together. This edible addition holds the roll together and adds more flavor. Now whisk together ½ cup of water, ¼ cup of Soy Sauce, and 1 tsp. of garlic chili paste. Pour this overtop the casserole. Cover with foil and bake for 30 minutes or so. You will love the flavor and abundance of this wonderful meal. 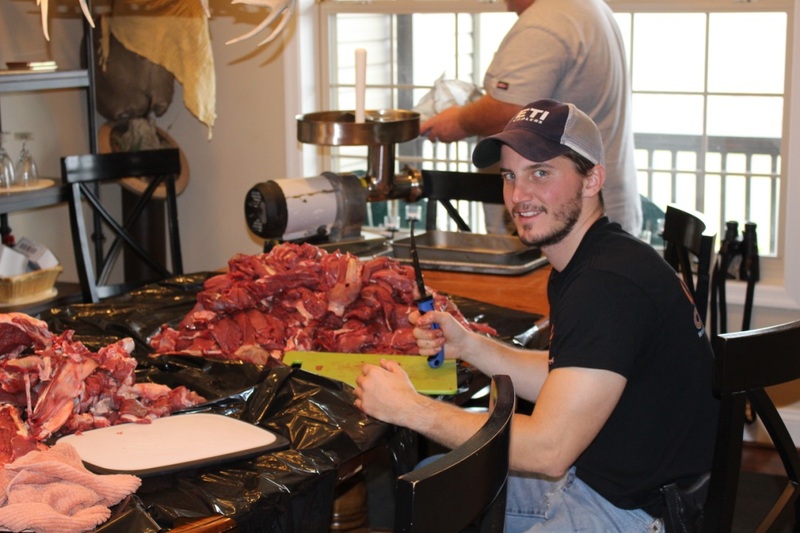 Hunting for new ways to enjoy your deer meat is always fun. Cooking and utilizing deer is all a part of the hunt. There are few new recipes, just variations on the same basic concepts of cooking that we do every day. Rarely does anyone even know that I am serving them deer. Wild game does tend to be healthier and more delicious than store bought, chemical laden products. Serving wild game that you harvested, processed, and prepared is a true act of love.